As a film, Much Ado About Nothing makes for a decent piece of theatrical writing. This adaptation is staffed by a rather talented team of actors who do well reflecting the nuances of William Shakespeare's source material, but to call Joss Whedon's latest project a movie in any sense would be an insult to anyone who has a love for the craft. Much Ado About Nothing, for the uninitiated, is, as was Mr Shakespeare's style, the tale of two star crossed lovers who must navigate their way through the odds to be with each other, held back by their own stubborn pride. It seems the whole world can see Benedick (Alexis Denisof) and Beatrice (Amy Acker) are meant to be together but each bears a stoic refusal, based on hubris and denial, to accept their fate. Whedon's adaptation uses Shakespeare's acclaimed dialogue ad verbatim and it is to the cast's infinite credit that they can recite the verbose soliloquys and zippy, zesty, archaic lines with a rhythm and tone that superficially sounds like the exchanges of real, contemporary individuals. Yet, even in these performances, it becomes clear that Whedon is uncertain what he's trying to achieve - as fantastic as both performances were, Denisof's clowning, gurning and theatrical pratfalls appear to have come from an entirely different film to the sober, minimalist performance by Reed Diamond as Don Pedro for example. 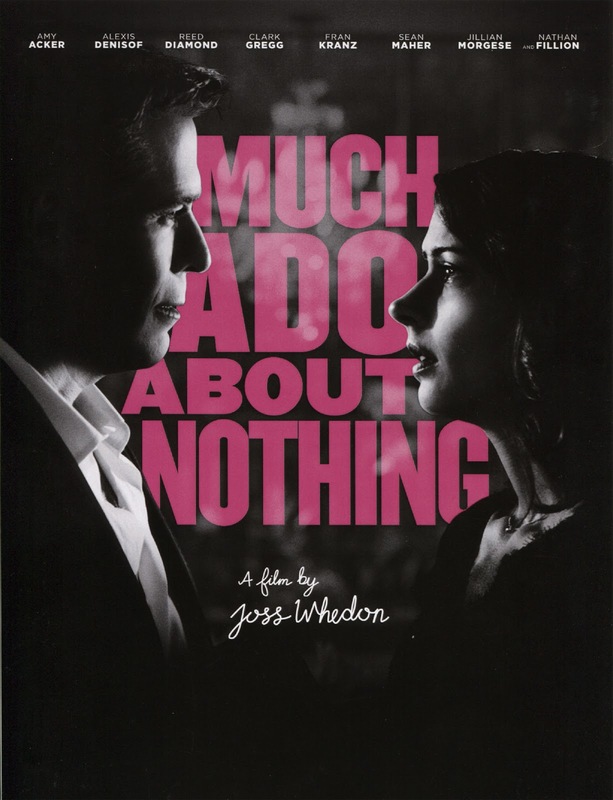 Much Ado About Nothing is incredibly muddled like Whedon has no idea what he's aiming for - is he making a would-be stylised indie movie which just happens to be based on a Shakespeare play? Or is he staging a theatrical performance on film? I'm not sure Whedon could answer this question as the project appears to be the height of laziness, with little consideration put into the adaptation behind the initial premise. The Hollywood maxim, used throughout the years, is "show don't tell" but, in the instance of this movie, based on a play filled with long passages of exposotional dialogue, there is little to show (in this inertly shot, one location movie) and far too much to state. As much as Shakespeare's dialogue is often vibrant, lively and full of verve, when read from the page, the same cannot be said of this film's aesthetics which seem to consist of simply pointing a camera at whoever is acting. It's simply not good enough for a professional film-maker to have put so little consideration into how their film should look and feel. The tone is further encumbered by Whedon's own soundtrack which consists of poorly written half ideas which pop up at all the wrong times and places with moods essentially the opposite to what is being portrayed on screen. Much Ado About Nothing is the laziest film I've seen since Keith Lemon: The Movie. The performances are great and not many people would criticise the source material so it soon becomes clear that the worst thing about Joss Whedon's Much Ado About Nothing is, sadly, Joss Whedon. Much has been made about the fact that Whedon apparently shot the entire project in one week (a canny piece of marketing which neglects any pre and post production work from this figure) - it would, however, have been much better for all of us if a bit longer had been taken to ensure a fully finished project had been delivered. Instead, the adaptation which has been delivered to the cinema, feels exactly like what it is - an overindulged director rushing out a vanity piece with little rhyme or reason. If at points it feels like a man simply pointing a camera at his friends acting out Shakespeare in his house then that is exactly what this is - Much Ado About Nothing is not really a cinematic film but rather a home movie that should have stayed that way: in Whedon's home, not on our screens. So, you hated it Kieron - and you didn't even mention the lack of colour, which was maybe to make it look less like a home movie filmed in a Hollywood back garden, and give it more of a retro [even 'serious'] feel? Never mind, I loved it - but then I would happily watch Amy Acker's home movies til the cows come home . . . It's a goofy movie because of Whedon and the cast that he supplies, but still worthy of Shakespeare. Good review Kieron.